For all the talk of social media services like Twitter and Facebook replacing RSS, I still find it to be the best way to get news quickly and efficiently, and it seems like Mac (s aapl) developers agree. 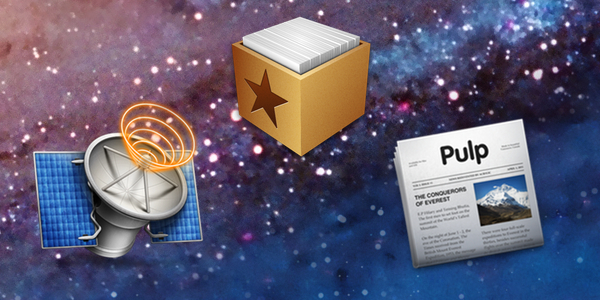 A quick look at the Mac App Store shows quite a few RSS reader options, but here’s a look at three of the best: Reeder, NetNewsWire Lite, and Pulp. 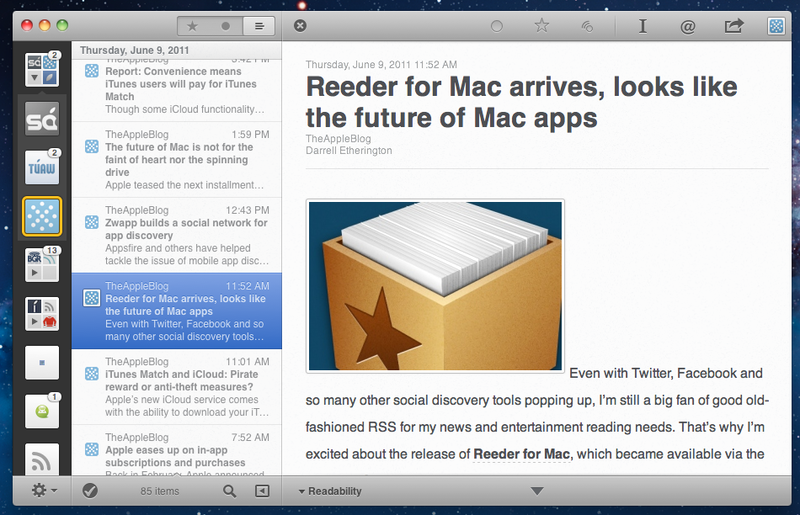 Reeder started its life as an iPhone app, got an iPad upgrade, and now finally has come to the Mac. This evolution helps explain why it looks and works like a Lion app already: It has fade-in scrollbars, multitouch gestures, and there’s even an option for monochrome sidebar icons, just like those found in the new Lion Finder. Reeder only syncs with Google Reader (s goog), so you’ll have to set up a Google account if you want to use it. However, Reeder’s integration with Google’s web app is stellar. The keyboard shortcuts are exactly the same, and you can manage your Google subscriptions within Reeder by deleting feeds, adding new ones, or making folders. 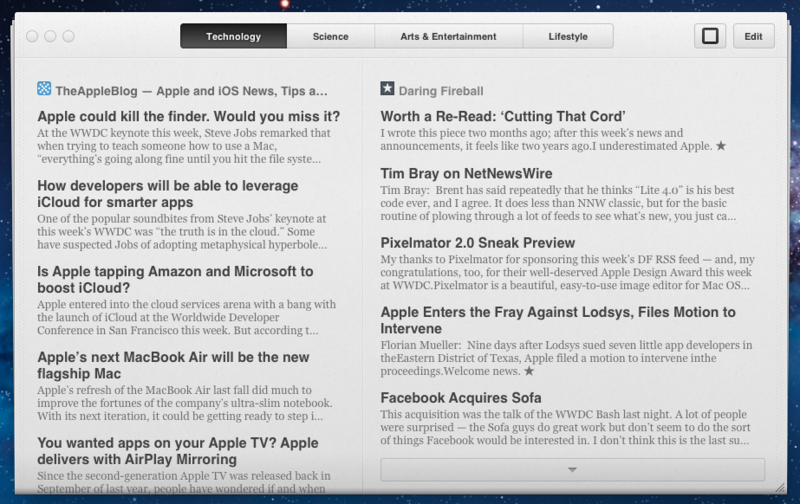 Sharing, starring, and noting articles can also be done in Reeder. Reeder can share articles with numerous third-party services, including Twitter, Instapaper, ReadItLater, Readability, Pinboard, Delicious, and Zootool. Services can be individually disabled as desired, and you can add shortcuts for each in the toolbar. 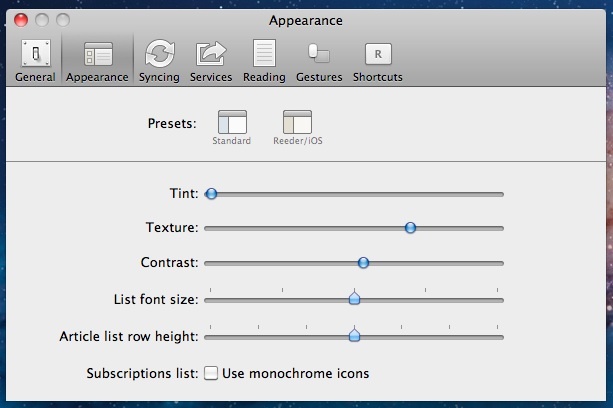 Reeder offers a bevy of other customization options as well. You can change its appearance by choosing from two presets: one that looks like Reeder for iPhone, and another that uses standard OS X colors. These presets can be customized with a unique slider system, allowing fine-grain control over the UI. Keyboard shortcuts, multitouch gestures, and third-party services can also be customized to your heart’s content. Reeder is a good app for power users and general users alike. It offers a lot of options, so power users can get their fix, but the interface is simple enough that new users should figure it out quickly. Since Reeder is also available for iOS, it’s a good choice for users with multiple Apple devices, since the Google Reader sync ensures your feeds and read items will be synced across platforms. NetNewsWire has a more traditional interface than Reeder or Pulp, but it’s no more difficult to use, and it still looks great. It doesn’t sync with Google Reader, so all feeds are managed locally. The lack of Google sync could be a dealbreaker for some, but you can import and export your subscriptions in OPML, something Reeder can’t do. Article Styles let you change the way articles look. Another thing NNW has that Reeder lacks is Article Styles, which are six pre-defined CSS style-sheets that change how an article is displayed. You can customize these style-sheets, but it involves messing around in the app’s Resources folder, so it’s not exactly easy. NNW has many limitations. 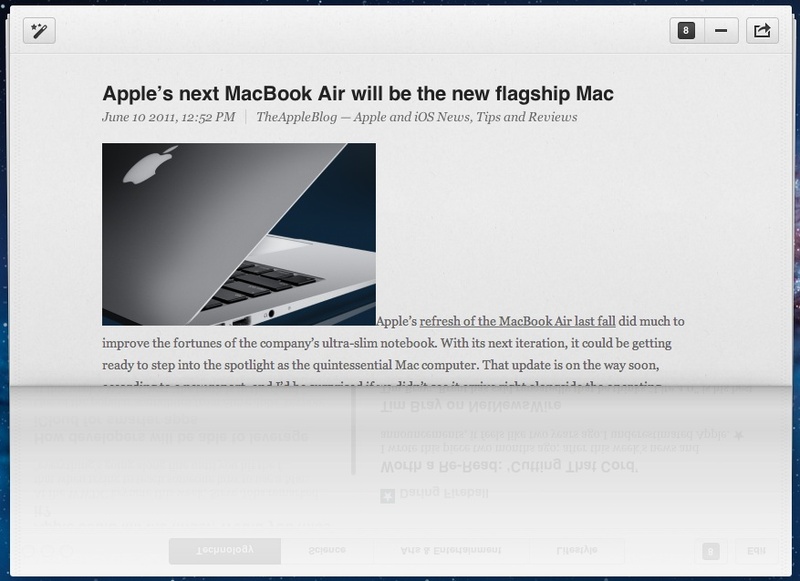 It can only share articles with Twitter, Instapaper, and MarsEdit (a blogging app). It isn’t very customizable beyond moving buttons around and hiding the toolbar. It’s also 64-bit only, so it won’t run on older Macs with Core Duo processors. 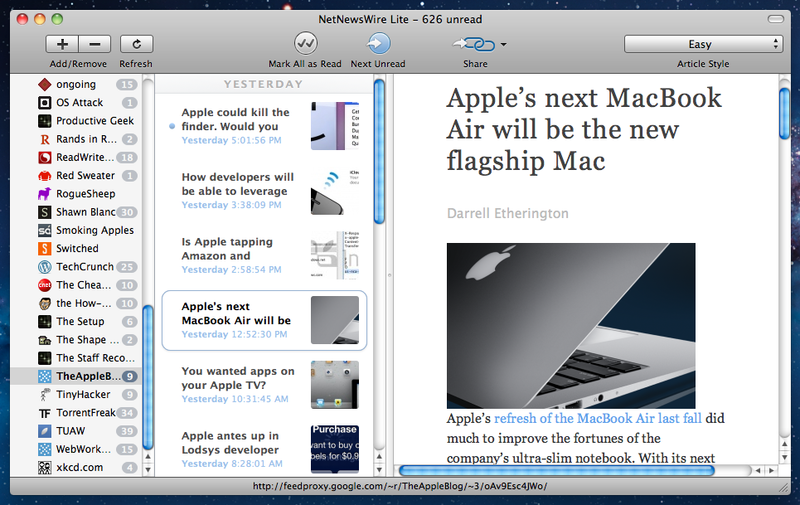 But if you just need a cheap, no-frills RSS reader, NetNewsWire Lite is your app. The little it does, it does well, and for free. It’s also worth pointing out that NNW is in a transition period, having been acquired by Black Pixel, and a more full-featured version should come out eventually. Pulp is relatively unknown compared to the other two apps mentioned, but it was recently featured in the Mac App Store. Rather than competing on features, Pulp’s big strength is its interface, which mimics a newspaper. It’s organized by pages and columns; each page can have multiple columns, and each column can have multiple RSS feeds. Pulp is very easy to use, and offers a good alternative to using folders to sort content. However, the newspaper-like organization is less practical for users with lots of RSS feeds. I’ve had upwards of 4,000 unread articles in a single refresh, and the thought of trying to sort through that many with this interface is daunting. Another unique UI element of Pulp is the Shelf, a wood-themed drawer that you can drag articles into for later reading. It isn’t going to replace Instapaper for power users, but for the average user, it works. Speaking of Instapaper, Pulp has it as an integrated service sharing option, as well as Facebook, Twitter, ReadItLater, and Readability. That’s not as many options as Reeder provides, but it should be enough to keep most users happy. Like NetNewsWire, Pulp doesn’t sync with Google Reader, but it does have its own syncing implementation called Pulp Sync. Setup was painless, and worked as advertised on multiple Macs, even preserving my custom column configuration. Pulp's article view wastes a lot of space. The one thing I have to complain about in Pulp is how articles are displayed. There’s a huge chunk of wasted space devoted to displaying a reflection of the app’s main screen below the article. Clicking on the reflection brings you back to the main screen, but a simple back button would have sufficed. I’m not sure why the developer thought this was a good idea, and it’s disconcerting that it’s still there, since the app has already seen multiple updates. Which RSS reader do you like the best? Is there one that isn’t on this list that’s better than these options? Tell us about it in the comments. I use http://twitter.com/#!/caffeinatedapp for syncing with greader. I really like it compared to the rest. I vote for Vienna. Used it since…I don’t know…a long time now. Works for me, and it’s free. Here’s another fan of Vienna, surprised not to see it in recommended list. And yet probably somehow contractually complete. Limiting discussion to those on the app store was probably not that enlightening. Another alternative especially for use with Google Reader is the free Gruml (http://www.grumlapp.com/). I have been using it for a while now since NetNewsWire does not integrate with ReadItLater. I’ve been using feedly (http://www.feedly.com/) for weeks now. Replaced Reedly beta for me. The NetNewsWire in the review is the one in the App Store, which I believe is version 4. Version 3 is still available at netnewswireapp.com; it does integrate with Google Reader, and is probably still the newsreader of choice for power users.